Studio Gallery : open by appointment with flexible hours. Located 27 miles from Grayton Beach Florida / the Scenic Hwy 30A beach area in an easy to find location right off North Hwy 331 . Contact: call text or email for an appt. and directions to studio. 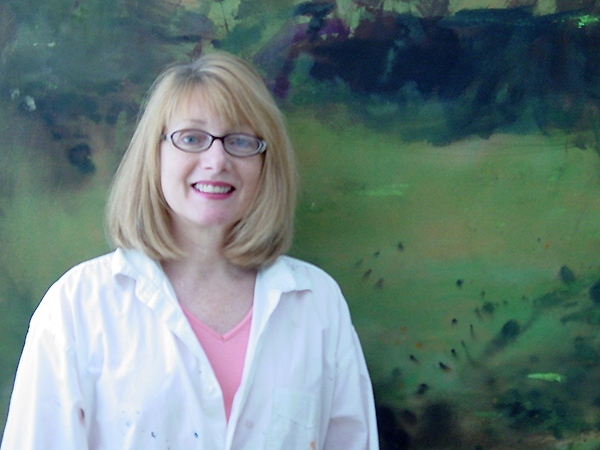 About: I am a full time professional artist living in the beautiful Florida Panhandle. I live close enough to the beach and emerald green waters of the Gulf of Mexico to enjoy it regularly but far enough away in the country where I have a little space, peace and quiet. I live with 6 big rescue dogs and a very verbal green parrot. When I’m not painting or doing gallery business I enjoy a walks on the beach, a little gardening, reading about health and wellness, riding my bike or walking the dogs. About my art : How do I describe thoughts or emotions or things and events without using words? How do I use the process of mark making as minimally as possible but still make an impact visually. As I’ve matured as a painter I seem to spend a lot of time thinking about how to pare down an idea to its most minimal form yet still have something interesting to say. My painting process is simply a dialog of my emotions and my mediums. Building up layers of translucent and or opaque washes while using dynamic gestural strokes to create focal points. Working in short bursts of activity without a specific image in mind in the early stages I let the painting kind of evolve into its own. As the painting eventually reveals itself I will more consciously direct it to a finish point. I try hard not to work it or finish it to death. I want the work to have a little mystery to it with just enough undone-unsaid so the viewer can engage in creating a finish or meaning in a personally meaningful way.